You are in the car, listening to your favorite radio station. Today was your “running errands” day. You went to the bank to take care a financial situation, had coffee with a friend, and went to the grocery store. As you turn into your neighborhood, you notice a termite pest control vehicle parked right next to your house. You pull into your driveway and start unloading groceries from your trunk. As you are on your last trip, your neighbor walks out and explains you her situation. Apparently she has a termite infestation in her home. The Cave Creek termite exterminator found the termite colony in the basement and determined it’s been about six months since the colony settled. 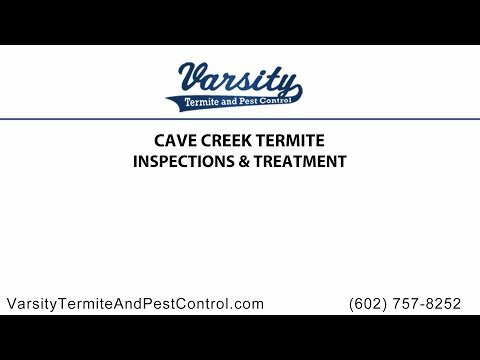 Your neighbor is getting a termite treatment in Cave Creek that will eliminate the termites and spraying pesticide to protect her home from future termites and other pest. Remove dead wood from your property. Keep firewood, lumber, paper away from foundation or crawl space. Remove excessive plant cover and wood mulch. Wood on your home shouldn’t contact the soil. Place screen on outside vents. Repair leaking faucets, water pipes, and A/C units. Keep gutter and downspouts clean. Get rid of standing water on roof. Keep all vents clear and open. Seal entry points around water and utility lines or pipes. Half of the list are about decreasing the food source and the other half is making sure your house is not habitable for termites. The main food source of termites is cellulose. Cellulose is an organic compound that is found in plants’ biology. Cellulose is found in wood, and wood is the common food of termites. Reducing the amount of wood/cellulose related materials will decrease the possibility of termites in your property. Suggestions from 1-5 gives you an idea of what to look for. Adding to that, most people store their personal belongings in cardboard boxes or/and plastic containers. Both material attracts termites, however we recommend to use the plastic containers and maintaining them as clean as possible. In other words, keep your property and house clean and well maintained. That will not only reduce the possibility of termites in your home, but as well as other pest. The suggestions above are not 100% guaranteed that termites will never step a leg in your home, other variables are considered. Talk with your neighbor. Ask them how they spot the signs of termite? What kind of termites they had and for how long, and what their termite treatment is and for how long as well. After that, call a termite pest control company. Varsity Termite and Pest Control will answer all your questions and concerns. We can also arrange for termite exterminator conducted a free termite inspection in your home. And if you are paranoid that termite might move to your house, we can decide on a termite treatment to eliminate that possibility.